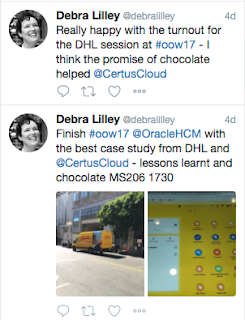 DHL Logistics are a Certus Customer rolling out Core HCM globally. The first phase of two customers goes live in just a few weeks so this was a very current story. DHL Supply Chain is part of the world’s leading postal and logistics company, Deutsche Post DHL Group, and it has embarked on an ambitious HCM cloud project. Currently, DHL has several different solutions around the world, many of which are based on Oracle E-Business Suite or Oracle’s PeopleSoft products. An in-house team of experts support these systems, and a primary objective for DHL was to ensure that the team is self-sufficient in Oracle Cloud applications. DHL awarded the implementation contract to Certus Solutions. In this session hear from the implementation team about the project start in Spain and Singapore in 2017, and how over the course of the wider project, Certus will step back enabling the DHL team to complete and support their global operations. It used to be that the Thursday first thing session was the worst slot at OOW, but this year there were no Apps sessions on the Thursday so I guess, 5:30pm - 6:15pm is a pretty poor slot. In fact we were in a corridor of 6 rooms, right at the end, and each of the other rooms had a sign saying 'there are no more sessions in this room today. Rather a Mary Celeste feeling. Anyway, with much tweeting, promises of fun, chocolate and of course english accents, we didn't do too bad. In the audience we had analysts, Oracle, DHL Express (another part of the wider family) and other end users. 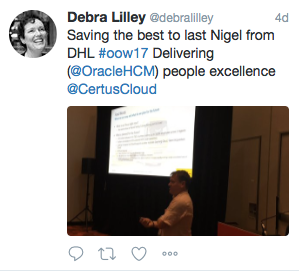 Also there was the DOAG, the German user group who were there because DHL is part of Deutsche Post, and Nigel & Certus will be presenting there in November, as well as at UKOUG in December. One good thing about being last is there is no worry about over running, except perhaps when the conference centre is being dismantled behind the wall you are in front off. But there were good questions and Nigel enjoyed telling their story. Slides will be available on OOW website immiently.